Other health care professions have an extensive history of utilizing technology in the delivery of their patient care. 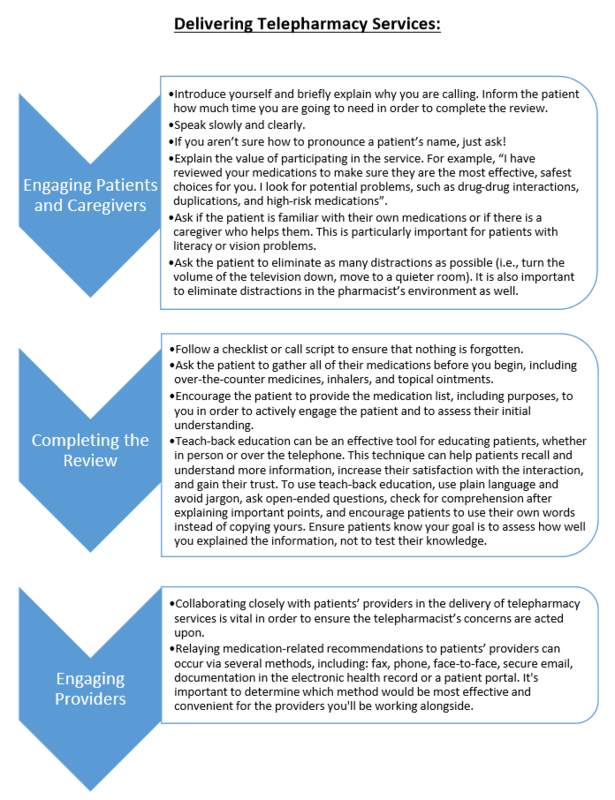 “Pharmacist care” in the description above is “the provision by a pharmacist of patient care activities with or without the dispensing of drugs or devices, intended to achieve outcomes related to the cure or prevention of a disease, elimination or reduction of a patient’s symptoms, or arresting or slowing of a disease process.” The Model Rules also include definitions for coordinating pharmacy, remote pharmacy, and remote dispensing site. DeWalt D.A., Callahan L.F., Hawk V.H., et al. Health Literacy Universal Precautions Toolkit. Prepared by North Carolina Network Consortium, The Cecil G. Sheps Center for Health Services Research, The University of North Carolina at Chapel Hill, under Contract No. HHSA290200710014. AHRQ Publication No. 10-0046-EF. Rockville, MD. Agency for Healthcare Research and Quality. April 2010. When delivering pharmacy services across state lines via technology, pharmacists are required to adhere to the policies and regulations of the state in which the patient is located. Many states require health care providers to hold a license in the state in which the patient resides, which presents a significant barrier to the implementation of many telehealth programs. The same HIPAA requirements exist for health care providers whether they are administering patient care in person or via telehealth. Electronic files need to be stored securely and extra precaution needs to be taken to ensure that the both sides of the telehealth consultation (i.e., both the pharmacist’s and the patient’s environments) are private. For example, when using video conferencing, windows should be covered to ensure that a passerby cannot inadvertently view patient records and telephonic consultations should be held in a place that would not allow for unauthorized individuals to overhear the conversation. All technology utilized is required to be encrypted and HIPAA compliant. It is important to consult with an information technology and/or information security team to perform risk assessments prior to first using a new software. Medicare in general does not reimburse pharmacists for telehealth at all because pharmacists are not recognized providers. Instead, most models with pharmacists are either part of a bundled payment or grant or contract service. Disclaimer: Each state has different laws about what and who they reimburse, so that is challenging because every state is different. Please refer to your state board of pharmacy for additional details. Learn about successful telehealth programs! These resources were created by the Telehealth Committee of the Medication Management SIG. Please note APhA members must login to view the PDFs.